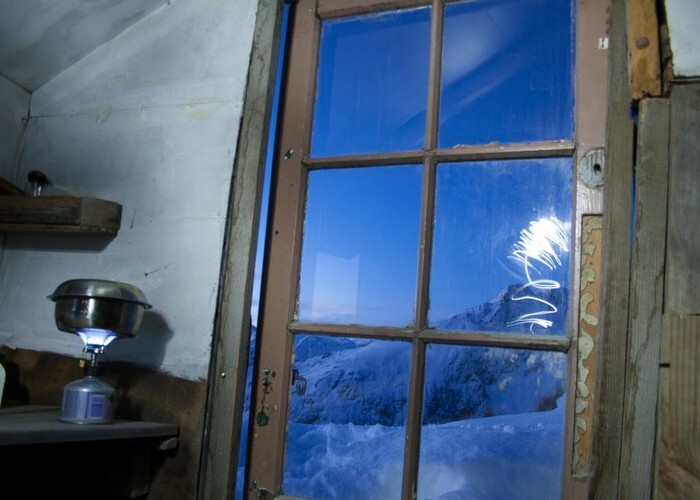 A gentle climb through a mining area to a small hut with panoramic mountain views. Morning view from Heather Jock Hut. • By Matthew. Car park south of Buckler Burn just below Glenorchy. Although in snow over winter, the Heather Jock Hut is quite accessible without crampons and ice axes due to the easy climb along the mining road. Heather Jock Hut • By Matthew. Licence: cc by-nc-nd. From the car park and shelter just south of Buckler Burn, a 4WD road leads inland, bending left past a house, joining on to the old Judah Road, and beginning a gentle climb. Along the road, numbered interpretation sites relate to descriptions in a brochure available from DOC. The road passes the first site, the Glenorchy Battery after 30 minutes. Here, water-driven stamping batteries crushed the scheelite ore to begin the extraction process. The Glenorchy or State mine is 20 minutes further on, marked by a massive schist mullock heap. At the bottom of the heap is an old hut and the boggy entrance to the mine itself (all mines are unsafe to enter). Despite its unprepossessing appearance, this mine was extensive, running on seven levels between the main access adit, and employing 25 miners. Beyond the State Mine, the road turns around the northern face of Mount Judah and opens up views of Mount McIntosh across the Buckler Burn and Mount Alaska to the right. The road divides 1.5 hours from the car park) with a route to the left leading down to "The Junction." The Judah Road continues upvalley. 45 minutes onward, a second junction is reached. Drop off the Judah Road here along another road down to a patch of beech forest and a crossing of Bonnie Jean Creek. Jean Hut is located on the road just beyond the forest (10 minutes from the junction). It is a tidy red shack made out of flattened 44 gallon drums, with rocks dangling from wires to hold the roof down. Overnight use is prohibited. 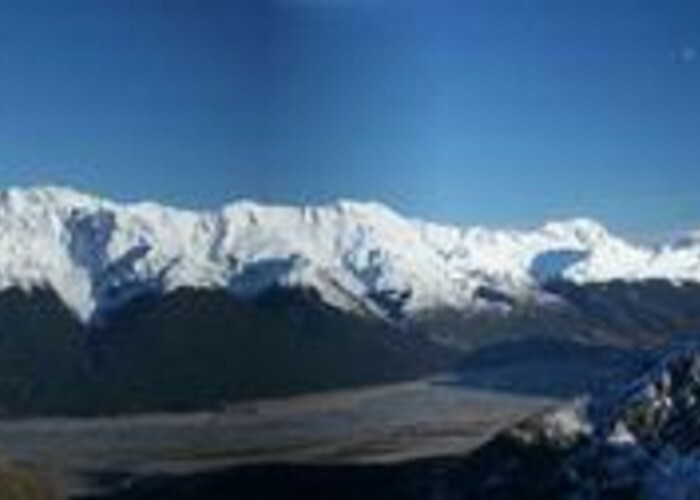 From here, the road zig zags countless times up the face of Mount Alaska, climbing through tussock and large speargrasses. Eventually, another junction is reached, with routes to Heather Jock and Bonnie Jean Huts. It is 15 minutes more climbing to Heather Jock. The hut is well situated, with old mining apparatus nearby. There is an old woodburner in a state of disrepair in the hut, and a small water tank, but no toilet. Heather Jock Hut • Basic Hut/Bivvy (DOC). Capacity: 3. From Heather Jock Hut, drop down to the top junction and take the road down and left to nearby Bonnie Jean (30 minutes). This hut site is well restored, with the miners' quarters and workshop available to view. The cables used to transport ore in a bucket down the hill are still in place, as is the tractor that used to drive the cables. 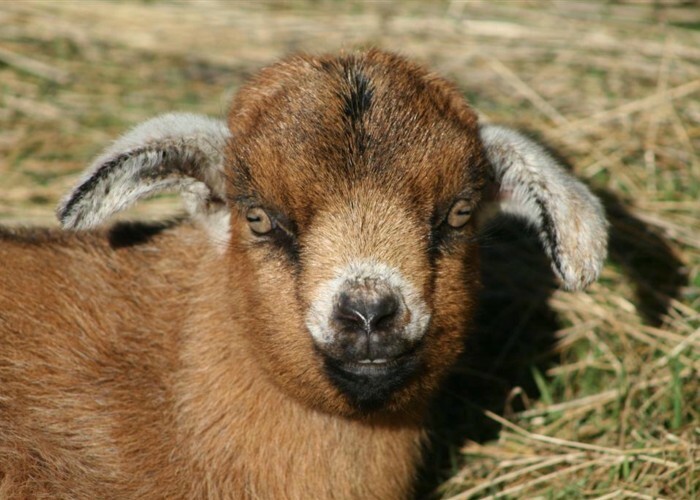 Goat kid • By Matthew. A foot track drops from here down into the head of the Bonnie Jean Creek, crossing over and meeting the top of the Judah Road. Continue on down the Judah Road past the foot of the cable way, the junctions, and out to the car park. Added 25 August 2008 by MatthewMatthew. 2 revisions, most recently 25 August 2008 by MatthewMatthew. 424 views in the past year (35 per month).